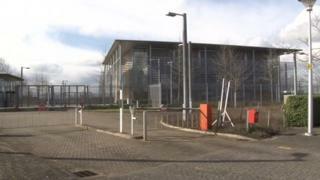 The Fire Brigades Union says it is "perverse" that a £23m control centre remains empty, eight years after it was completed. The building at Waterbeach, Cambridgeshire, was finished in 2009 but a year later government plans for it were scrapped. It costs about £2m a year to maintain, the FBU says. FBU eastern regional secretary Riccardo La Torre said that money could have funded 16 fire stations for a year. The plan for regional control centres was set up by the Labour government to replace existing county control centres. In the eastern region, the Waterbeach headquarters would have answered all emergency fire calls from Bedfordshire, Cambridgeshire, Norfolk, Suffolk, Hertfordshire and north Essex. However, the project was abandoned in 2010 after the coalition government determined the "requirements of the project cannot be delivered to an acceptable timeframe". The unused 30,488 sq ft (2,832.5 sq m) Waterbeach building centre has been for lease ever since. Image caption The FBU's Riccardo La Torre described the situation as "perverse"
Mr La Torre said the union was "shocked" to hear the building was still empty. "The cost of it - up to £2m a year, we're being told - that's the cost to the taxpayer, just to fund this empty room... is perverse, to say the least," he said. "The money spent on this building could have been invested much more productively in the fire service at a time when we're seeing record cuts to the fire service in the east of England." The union, he said, was against the idea of regional centres from the start as "local knowledge" was one of the essential components in getting help to people in emergencies. "Sixteen million pounds would fund approximately 16 whole-time, 24-hour-a-day fire stations for the best part of a year." The Department for Communities and Local Government, which is responsible for the centres, including the one at Waterbeach, said it had "revised the contract for ongoing maintenance of the remaining control centres and the maintenance of specialist equipment has been reduced to the minimum legislative requirements for an unoccupied space". "Due to the terms agreed by the previous administration from 2007, we're unable to sell the regional fire control centres until their leases expire, which means taxpayers continue to pay for the costs of maintaining these empty buildings."